For the countless numbers of immigrants that braved the cold Atlantic waters in hopes of a brighter future in America at the dawn of the twentieth century, the Statue of Liberty must’ve appeared as quite the welcoming sign. Lady Liberty stood tall and defiant against the elements, offering a safe haven from the old world they left behind. To the dismay of those wide-eyed immigrants, such a promise was rarely fulfilled, and for many, it would be a promised reneged the moment their boats docked at Ellis Island. The facilities at Ellis Island were, for all intents and purposes, the gateway into America. One would be hard-pressed to find a singular facility so fraught with history, or that has had such a lasting impact on so large a group of people. It was in the marble chambers of Ellis Island that these immigrants were given new, Americanized surnames and the circumstances of their entry into America were established, and it was here where they found out that the promise of the American dream sometimes came at the expense of their idealism and integrity. Director James Gray’s grandparents were just two of the untold numbers people who entered America through the gates of Ellis Island. 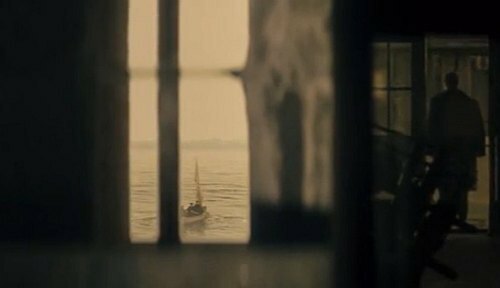 Their particular experience inspired the story for Gray’s THE IMMIGRANT (2013), a riveting period drama about hopeful lives torn apart by Ellis Island’s admittedly dehumanizing assimilation processes. 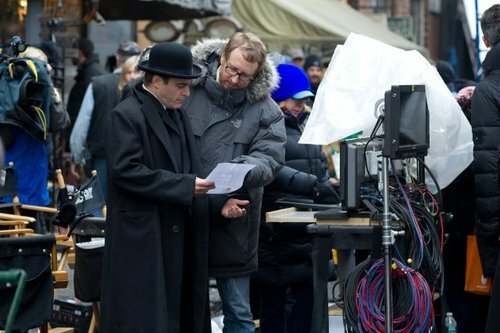 THE IMMIGRANT marks Gray’s return to the big screen after a five-year absence following 2008’s TWO LOVERS, reuniting him with longtime collaborator Joaquin Phoenix for another look into the social experience of Eastern European immigrants in New York. It’s his most ambitious film to date, and perhaps his most unappreciated—The Weinstein Company essentially dumped the film in late 2013 with little advertising or support, leaving one of the best films of the year to flounder in the home video market in the hopes of gaining the appreciation it deserves. THE IMMIGRANT unfolds in New York City during the year 1921. Ewa Cybulski (Marion Cotillard) is a Polish immigrant who has made the long voyage to America with her beloved sister. Instead of finding the refuge they seek, they find only more hardship—her sister is taken away under suspicion of having contracted tuberculosis, and Ewa herself is scheduled for deportation due to an unsubstantiated rumor that she prostituted herself during the voyage across the Atlantic (when in reality she was actually raped). At the last minute, Ewa is saved by Bruno Weiss (Joaquin Phoenix), a fidgety, dark man who poses as an immigration consultant at the Island so that he can recruit women into his exotic “Women Of The World” burlesque act. With very little options to choose from, Ewa succumbs to Bruno’s fold and begins her new life as a burlesque performer and a reluctant prostitute in the hopes that she’ll save up enough money to get her sister out of the hospital. A ray of hope emerges in the form of Emil (Jeremy Renner), Bruno’s cousin and a magician going by the name Orlando. He hopes to take her and her sister away with him out west on tour, leaving this dreadful place behind for good. It’s almost too good to be true, and it is—Bruno’s protectiveness over Ewa and his debilitating jealousy towards Emil’s effortless charms thrusts Ewa directly between these two men as they fight over the right to decide her future. Gray’s films are admired for their inspired casting, and THE IMMIGRANT definitely follows suit. He reportedly wrote the film specifically for Phoenix and Cotillard, and it shows—both actors deliver powerful, nuanced performances devoid of cliché or indulgence. As the titular immigrant, Cotillard provides a quiet, yet strong and determined presence as Ewa. Phoenix returns for his fourth consecutive collaboration with Gray, and his first with his director after his infamous post-TWO LOVERS performance art stunt for Casey Affleck’s I’M STILL HERE (2010). Phoenix is quite adept at playing troubled, eccentric men who appear uncomfortable in their own skin, so it’s a little surprising to see him act so normal here. His Bruno Weiss presents himself as a kindly, clean-cut businessman in a bid to inject some legitimacy into his vocation as a burlesque hustler and pimp. He’s merciful and devoted towards his girls, but he has a tendency to get carried away with his emotions. Ultimately, Bruno Weiss is a coward, and Phoenix embodies this aspect of the role with a surprisingly quiet intensity. Jeremy Renner is dashing and debonair as Bruno’s cousin Emil, a mischievous showman who finds himself drawn to Ewa’s charms. However, behind Renner’s rakish smile lies a fundamental black-heartedness that only shows itself in a pivotal sequence, yet drives Emil’s actions throughout. Watching THE IMMIGRANT, it’s hard to say why The Weinstein Company decided to give it such a lackluster release campaign. The film boasts stunning, unconventional performances, lustrous production design and handsome visuals—by all accounts, it should have been a contender for all the Oscars. However, I have to admit there’s still something slightly off about the look of THE IMMIGRANT, and I suspect it may have to do with the film’s unconventional color timing. Shot by veteran cinematographer Darius Khondji, THE IMMIGRANT certainly has the “epic period film” bonafides: 35mm film acquisition, an anamorphic 2.35:1 aspect ratio, and classical camerawork that gives an elegant, disciplined sense of movement and pacing to the picture. Gray doesn’t pull any punches in referencing the look of Francis Ford Coppola’s THE GODFATHER PART II (1974), replicating its distinct golden/sepia color cast and pitch-perfect period set/costume design (courtesy of TWO LOVERS’ production designer Happy Massee). However, Gray goes one step further in an effort to distinguish THE IMMIGRANT—he applies a liberal coat of yellow onto the midtones in an effort to recreate the particular glow of electric lamps from the period. Sometimes, however, there’s quite simply too much of a yellow cast, and the result is unnatural and sickly-looking. Combined with a strong bluish cast in the shadows that appears as if the film went through an Instagram filter, Gray’s color timing for THE IMMIGRANT deviates quite substantially from the conventional look of its genre while exaggerating the faded, amber patina of his previous films to an almost-cartoonish degree. One nice aspect about this aesthetic, however, is that the reds cut through quite strikingly, enriching the image during the few times the color appears onscreen. Through his original score for TWO LOVERS and music consultation services on WE OWN THE NIGHT (2007) and THE YARDS (2000), musician Christopher Spelman has emerged as Gray’s go-to guy for all things music. For THE IMMIGRANT, Spelman crafts a quiet, romantic orchestral score that never overtakes Gray’s imagery. It’s not distinctly memorable in and of itself, but it reinforces Gray’s themes and keeps everything aloft. To give us a greater sense of the period, Gray also incorporates several folk songs—both of Eastern European and Americana origins—that provide us with a glimpse of this unique time and place in history. There’s also the appearance of a rather beautiful classical cue: John Tavener and Mother Thekla’s “Funeral Canticle”, a gorgeous chamber choir piece that can also be heard in Terrence Malick’s 2011 masterpiece,THE TREE OF LIFE. Gray’s body of work has always assumed the point of view of outsiders relegated to the outer boroughs of New York City, looking in on the glittering lights of Manhattan, a metaphor for those who desire the American Dream yet constantly find themselves denied access. THE IMMIGRANT is easily the most literal illustration of this metaphor, anchored by the image of the Statue of Liberty standing as a beacon of hope for those who wish to enter America. In hindsight, it’s easy to see that Gray was destined to make a movie like THE IMMIGRANTS– it’s a sublime melding of directorial conceits and thematic symbolism. There’s been a distinct progression through Gray’s filmography, with each successive film seeing its characters getting increasingly closer to Manhattan. TWO LOVERS brought its characters briefly into the island for the first time, but THE IMMIGRANT places them firmly within its walls. After a lifetime spent on the outside looking in, we’ve finally made it to Manhattan, and now that the American Dream is within our reach, we find out that it’s nothing like we had expected or hoped it to be. The characters that populate Gray’s filmography are firmly rooted in the Old World—there’s a heavy emphasis on family, culture, tradition, and ritual. Gray’s eastern European ancestry informs his characterization, and Ewa’s Polish background is further evidence of that conceit. THE IMMIGRANT’s drama stems from familial conflict, both in terms of biological and adopted family. Ewa’s entire arc revolves around her desire to save her sister from the machinations of the immigration process, and Bruno’s hatred for his cousin Emil originates in his frustration and self-loathing over the fact that he possesses none of Emil’s charms despite sharing his blood. Bruno also sees his harem of prostitutes as his family, a notion that drives his possessiveness and deludes him into thinking he’s acting in their best interests. Gray covers the religious bases by making Ewa a strict Catholic, a character trait that gives us several moments of religious ritual—confession, prayer, procession, etc. Gray has long held a talent for conveying his ideas through arresting visuals, but THE IMMIGRANT sees substantial growth for the director in wordlessly conveying his themes. His fondness for composing his shots via natural framing devices like doorways and windows is on full display, and oftentimes leads to sublimely subtle compositions that express Ewa’s alienation from this strange new world. The last shot in particular is a knockout, and without giving too much away, uses both a window and a mirror to depict both of the protagonists facing the world before them, armed with new discoveries about themselves and each other. THE IMMIGRANT provides a few other notable instances of simple images conveying weighty subtext. A scene in an Ellis Island holding cell sees Ewa pricking her finger and applying the blood to her lips in a bid to look fresh and healthy—an evocative parallel to similar practices by women in ghettoes and concentration camps during The Holocaust and a nod towards the innate strength and resiliency of the Polish people during hard times. Another instance sees Emil giving Ewa a beautiful white rose, only for Gray to later show the same rose having wilted from neglect after Ewa has embraced a life of prostitution. In respect to cinema culture and history, Gray’s films have always evoked the gritty aesthetic of late 70’s drama and crime films—this is certainly the case with THE IMMIGRANT, which doesn’t attempt to hide the considerable influence of THE GODFATHER PART II on its visual style. However, Gray’s references here also stretch even further back into cinema history, with Emil’s magic shows emulating the work of silver screen magician George Melies, or the late-second-act sewer chase evoking the climax of Carol Reed’s THE THIRD MAN (1949). THE IMMIGRANT shows an incredible amount of growth for Gray as an artist, which the director himself recognizes—he has stated in interviews that he personally believes THE IMMIGRANT to be his best film. As his first film to feature a female protagonist, THE IMMIGRANT affords him the opportunity to expand his worldview and reap the benefits of a wider experience. While it nominated for the prestigious Palm d’Or after its debut at Cannes, THE IMMIGRANT has inexplicably become the victim of an indifferent distributor, doomed to obscurity for the sin of not having a decent marketing budget. A studio’s faith in its product should by no means ever be an indicator of its quality, and those who care seek out THE IMMIGRANT will be rewarded with something of a masterpiece. Gray has always shown remarkable restraint in his aesthetic, but THE IMMIGRANT sees him mature exponentially as an artist and places him in the league of Martin Scorsese, Woody Allen, and the other premiere chroniclers of the New York experience. THE IMMIGRANT is currently available on high definition Blu Ray via Anchor Bay.